Of course our main activity is caving. 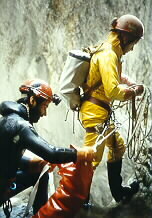 EVERY weekend, for as long as we exist, we organise at least one, but often 2 or 3 caving activities. Most of the time one team goes "classic caving", whilst another team goes "digging" or exploring. In general, these activities are held in the Southern part of Belgium, the Ardennes. 2/3 of our members prefer exploration above classic caving. We are one of the rare Belgian clubs who, systematically en frequently, go digging, prospecting, surveying, studying our Belgian karst. We have a long experience in these matters and most of our digs are paying! One of our strong points is that we don't get discouraged fast, and that every dig, how difficult it may be, is finished 'till the bitter end. Of course, in some cases, we find out (after 15 weekends of digging), that we have wasted our time. We then start a new dig... that's all. As soon as we have the possibility (long weekends or holidays) we go caving in foreign countries. Favorites are France (Doubs, Vercors, Causses, Pyreneeën enz.) and the United Kingdom (Yorkshire, Wales). Also Spain, Austria or Switzerland are sometimes chosen. Normally we go "classic caving", but since 1997 we have started exploring in Spain. Generally, in May, we go caving in the South of France for 1 week; in November in the U.K. for 1 week, and in july-august in France or Spain for 2-3 weeks. Long weekends are often spend in France, in the "Doubs" or "Jura". As mentioned, the summer holiday, since 1997, is used to go exploring in the French-Spanish mountains of the Pierre-St-Martin area. We already have explored some very nice caves there... click here if you want to know more about it. Some of our members participate regularly in exploration expeditions in countries such as: Spain (Picos de Europa), Austria, Switzerland, China, Vietnam or Jamaica. We sometimes go caving with other clubs. Since a couple of years, a very good collaboration between SC AVALON and Speleo CUEVA (Zolder) was realized.. 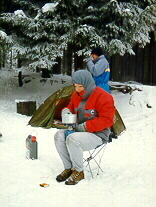 Camping is to most cavers a "normal" thin g, and we also prefer camping above any other way of staying. If possible we'll camp in nature or, in France, "à la Ferme". We avoid crowded 4-star campsites as much as possible. In general, we take the family along, so a bunch of kids is always present to cheer camplife up. 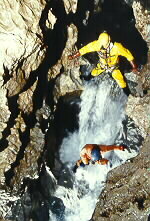 From time to time we go canyoning. 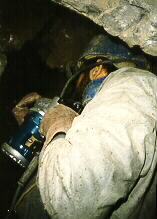 When descending canyons, normal caving techniques are used; in fact canyoning is more like caving than any other outdoor sport: only the cave roof is missing. Of course we like nice landscapes and/or tourist attractions, so now and then we act like normal tourists!